Request a Sample Form · Hy-Tape International, Inc.
Hy-Tape is a customer first company. Our sample program is for those in need of a gentle and application specific adhesive and we find that the best way to determine if our product is a good fit is for patients and caregivers to try it first. Occasionally we are targeted by Web sites that promote free products. This targeting causes a huge demand for free samples and can keep those in need from receiving a trial sample of Hy-Tape. We validate each and every sample request that comes in. We may also occasionally contact you to determine if the product you are wishing to try is the best fit for your needs. Due to shipping costs, our sample program is only available to those in the U.S., Canada, & Mexico. We apologize for the inconvenience and hope to offer our samples globally in the future. Allow 1-2 weeks to receive your sample. 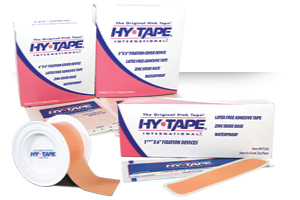 We will follow up with you to see how Hy-Tape has worked for you and get your valued feedback on our product. Please call 1-800-248-0101 to speak to one of our sales team regarding a sample request. Hy-Tape reviews each sample request and reserves the right to deny requests. Thank you for your interest and we hope Hy-Tape works well for you.